Great Hostel. The best one I stayed in Italy so far. Staff is great and really helpful. The place is clean and they have a great terrace on the roof. I had a really good time there. I had a great time in this hostel and could not recommend it enough to anyone who wants to visit the region and is looking for an authentic and chill vibe! We hebben een heel fijn verblijf gehad in dit hostel, het personeel/de eigenaar was verwelkomend en aardig. Het hostel was goed bereikbaar en op loopafstand van de zee en het Herculaneum. Daarnaast had de kamer uitzicht op zee en hebben we het (tot laat) gezellig gehad met andere reizigers op het dakterras! Als ik in de buurt ben kom ik zeker langs voor een langere tijd! I had a great time here. Staff is super friendly and I felt right at home. I would definitely come back!! What an amazing place! Located just south of Naples but very close to Vesuvius and can be reached easily by train from Naples. Claudio runs the place and he is such a nice guy!! In the morning he prepares a breakfast and he makes you a really nice coffee. The terrace is very cozy and great for chilling (until late). I definitely would've loved to stay here for longer, and I'll come back later! Claudio went out of his way to help me find a mechanic for my motorbike. Great service. Also, the atmosphere was great at all times, without getting loud or annoying. The rooftop terrace is an amazing place to chill out and meet people, and Ercolano is a perfect point to discover a great deal of interesting places from, including Pompei, Capri, Sorrento, Positano and of course Naples. One of my best hostel experiences ever. Best hostel i've been to so far! Wonderful host who wants nothing but the best for the people that stay there. I'ts a very nice hostel! The owner Claudio is helping you with EVERYTHING! He is really nice, and makes this experience great for his guest!! In the morning there is a simple, but okay breakfast and he will make you a real Cappuccino. The hostel is cleaned everyday. 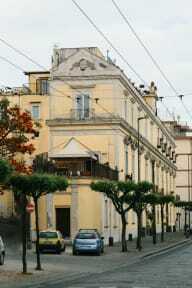 From this hostel its very easy to go to the Vesuvio, Scavi di Ercolano and Scavi di Pompeii.